The strongest trends impacting military demand for commercial satellite capacity over the next decade include growing use of satellite capacity to support new types of warfighting, which are increasingly dependent on broadband communications. Key among these are the expanded global troop deployments, primarily by U.S. defense forces, as well as use of satellites to support Intelligence, Surveillance and Reconnaissance (ISR) activities, in particular those carried out using a variety of Unmanned Aerial Vehicles (UAVs) or Remotely Piloted Aircraft (RPAs). While commercial satellites have increasingly been used to meet these requirements, there is still a bias in the military for specialized, proprietary capabilities, using military satellites. Given the range of uncertainty regarding development and deployment of new technologies, new regulations, and new market solutions, Futrons forecasting includes projection of a series of possible future states, not just a single demand scenario, with the key variables summarized below. Futrons assessment of demand for commercial military satellite communications suggests that the market is significantly larger than generally perceived, due to sizable demand for classified operations and agencies, as well as a rapidly increasing international customer base. Futron estimates the 2009 market size for the military segment at 390 TPEs for C-, Ku-, and Ka-bands, with a baseline forecast for the addition of almost 300 units through 2019, or 5.6 percent annual growth over ten years. Futrons forecast includes a full alternate view representing conversion of demand into Mbps, with military demand in 2009 estimated at almost 16 Gbps, growing to over 28Gbps in 2019. While the United States military and security forces represent the largest buyer, demand from international security forces is anticipated to grow in aggregate terms as well as an overall percentage of demand. Fast followers, such as NATO allies and Israel, will continue to require increased supply of commercial capacity. Other governments in the Middle East, Japan, Australia, and India will also likely require international commercial capacity. The geographic demand requirements will include in-theater operations as military communications are pushed lower into the warfighter ranks, as well as home country demand tied to training, backhaul, and redistribution of data. While Futrons forecast covers global military demand for commercial satellite communications capacity, it is estimated that U.S. military demand accounts for approximately 90 percent of global military demand for commercial satellite services. The rate of growth in demand for non-U.S. defense agencies is expected to grow at a rate similar to that of the U.S. military. The 2010 Futron ten year forecast of military demand for commercial satellite communications is developed based on a bottom up terminal forecast model. Within the model, demand is analyzed separately amongst aerial, maritime, land mobile, and land fixed terminal programs. Terminal demand is analyzed for growth in total number of terminals, terminal throughput, terminal spectrum usage, and overall terminal utilization levels within ten regions and the oceans. Demand is then assessed across all frequency bands. The results of this analysis are shown in the regional break-out below. 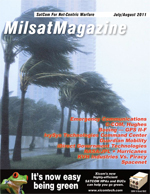 While this years military forecast does not model demand for secure military communications such as those provided by the Paradigm/Skynet system, the United States Advanced Extremely High Frequency (AEHF) spacecraft, or military demand for commercial narrowband satellite communications, Futron has developed extensive data on this market, and it will be included in future forecasts. This forecast does, however, include X-Band capacity provided on a commercial basis, in addition to C-, Ku-, and Ka-band. The U.S. DoDs FY 2011 budget outlines key structural changes that will increase demand for satellite communications through increases in targeted personnel (e.g., Special Forces) as well the conversion of Army Multi-functional and Functional Support (MFF) brigades to a modular design with satellite capability driven down through the brigade to the company level. These are examples of strategic decisions driving military demand throughout the globe. In addition to satellite communications providing the medium for tactical and strategic force projection, satellite communications supports troop morale. Access to the Internet and the ability to stay in touch with friends and family is a capability that helps retain professional soldiers within the armed forces during repeated overseas deployments. Morale support will likely become increasingly important as the hyper connected millennial generation constitutes an increasingly larger percentage of the military. To help enable access to commercial bandwidth, the U.S. military is pushing for new military broadband terminals to be compatible with commercial satellites. Naval forces are deployed for long periods of time. The U.S. Navy in particular projects military force through the deployment of ships in locations around the globe. These ships currently have an average of 12 Mbps. U.S. Naval planners plan to increase through put to ship to 20-100 Mbps during the forecast period. Strong growth in UAV/RPA deployments, with associated growth in satellite communications demand, is projected worldwide based on increasing number of systems and exponential growth in their capacity requirements as more sophisticated sensor systems are deployed. New ISR systems are under development in the majority of militaries around the globe. In this connection, the U.S. military has indicated its intention to migrate from the current Ku-band to the use of Ka-band to support its fleet of Global Hawk vehicles, and plans to deploy an upgraded Predator drone, designated the Gray Eagle, with advanced communications capabilities that will require up to 50 Mbps satellite communications throughput. The WGS constellation is a fleet of military satellites, currently three of which are in operation, which is intended to provide the majority of U.S. military operated satellite communication. Each WGS satellite operates at Ka-and X-band, providing between 2.1 and 3.6 Gbps of data throughput. In addition to the three satellites on-orbit, three more are in production for launch over the next three years, with the last of these being jointly funded by the Australian MoD. The U.S. government also recently authorized $182 million to start work on a seventh satellite, and it is projected that as many as 12 WGS satellites may be built, some with other allied military funding. The number of WGS satellite procured will impact the level of U.S. military demand for commercial satellite communications. One alternative increasingly being considered by a number of countries, including the U.S., is the use of commercial satellites to host military payloads either directly or through public/private partnerships. In some cases, such as the Paradigm Secure program operated by Astrium Services for the U.K. Ministry of Defence, the Skynet satellites are effectively military satellites operated by a private company. Another variation is the agreement whereby the Australian Ministry of Defense has contracted with Intelsat for UHF capacity to be owned/operated by the AMoD on an Intelsat satellite, a venture in which the U.S. DoD is also participating. Similar arrangements are also being considered by other bands including Ka-and X-band, including the potential use of the Inmarsat 5 satellites for military services. To the extent that these are payloads operating in military frequencies, they are not captured in this forecast The growing interest in, and use of such payloads, may, however, support the deployment of more commercial satellites for both military and commercial services.This will be an important trend to follow in future forecasts. Defense requirements for satellite communications include a range of commercial and military frequency bands. While militaries prefer to use their own frequencies, they have recognized the value of the flexibility offered by dual-use capabilities. Multiple military sources have noted the value of having more UHF capacity, particularly in the Pacific Ocean Region, given regional uncertainty/instability, the largely maritime nature of this region, and the lack of other capacity. Another region with specialized needs is Latin America, where the U.S. DoD has increasingly deployed both fixed and mobile satellite resources in support of multiple disaster response activities. To help address various type of satellite communications demand, commercial providers are considering development of hybrid terminals that can access wideband and narrowband spectrum. Such a capability may allow troops that experience interference in higher frequencies such as Ka-band to gracefully degrade into an L-band link that would provide basic communications capabilities. Similarly, a multi-band terminal that can access a broad spectrum of frequencies allows troops relying on the terminal to access the best space segment solution at the time of need and provide military planners greater flexibility to manage spectrum usage. Commercial communications satellites are creating new methods for using satellites that allow for greater flexibility to direct high capacity beams to mobile platforms. Such concepts would allow for high throughputs to mobile platforms enabling greater transfer of data from sensor systems that are continuously increasing in capability. The U.S. military indicates that it desires to improve its ability to create and manage hybrid networks both terrestrial and satellite based. It has also indicated that improvements are needed in the efficiency of spectrum usage from improved compression to interoperable and dynamic spectrum management. A range of new applications are expected to drive growth in demand for satellite communications around the globe. The increasing availability of information access and the ability to fuse information from various data sets to create useful knowledge is becoming basic to successfully projecting military power, and is a constantly evolving process. While requirements continue to increase, two emerging issues are critical to future operations and military expansion plans. The first issue is that changing priorities limit the funding/fielding of new military satellites.The second issue is that changing priorities and asynchronous program cycles make it difficult for DoD to match the availability of capacity on orbit with terminal deployments. These mismatches of capacity, equipment, funding, and demand are driving greater interest in more responsive procurement models. The cancellation of the Transformational Communications Satellite (TSAT) has led to a gap in wideband satellite communications capacity for the U.S. military. To fill this gap, the U.S. military is considering a number of traditional solutions including deployment of a greater number of military operated WGS satellites to other options such as hosted payloads, commercially operated military satellites, and other innovative procurement and operational concepts. In this connection, the U.S. Air Force is in the process of soliciting input from commercial satellite operators to help understand the range of solutions from which it might develop a new systems architecture. All of these new and evolving circumstances mean that demand is certain to evolve as well. Futron has developed alternative high and low scenarios around the baseline to reflect potential changes in key variables. At the end of the day, however, all forecasts indicate that demand for commercial satellite capacity to serve military users worldwide will continue to expand. Dustin Kaiser is a Senior Space Analyst at Futron, where he works with commercial and government clients addressing a range of international space markets from military communications to remote sensing and the commercial spaceflight industry, including spaceports, launch vehicles, and astronaut training. Mr. Kaiser has a B.S. in Aeronautics and is currently completing an M.S. in Space Studies from the University of North Dakota. In addition, he holds a commercial multi-engine pilots license and is an FAA certified flight instructor-instrument.